This versatile process is used to print a large variety of products. 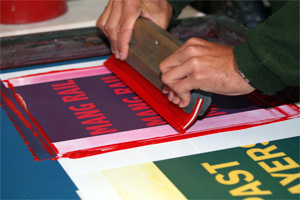 Some items suitable for screenprinting are Stubby Holders, T shirts, signs, stickers, bags, folders etc. The technology allows detailed quality images to be applied to many surfaces, from business cards to large scale flag and banner materials. Many small promotional items require this method of printing. Pens, key rings, stress balls and most plastic promotional items. Our embroidery service can apply your logo to Workwear, Corporate wear, Team uniforms, Caps etc. Many quality items are laser engraved. Metal barrel pens, key rings, and corporate desk items to name a few.